Shani Rhys James was born in Melbourne, Australia in 1953. Her father was a Welsh surgeon and her mother is an Australian actor and artist. She arrived in UK in 1963 with her mother. She attended Parliament Hill Girls School and trained as an artist at Loughborough School of Art and St Martins School of Art BA in Painting (1976). Initially she lived in Whitechapel and had studios at Butlers Wharf near Tower Bridge. She moved with her family to a derelict farm in Mid-Wales in 1984, painting initially in the old farmhouse front room and then in studios in the restored barns. 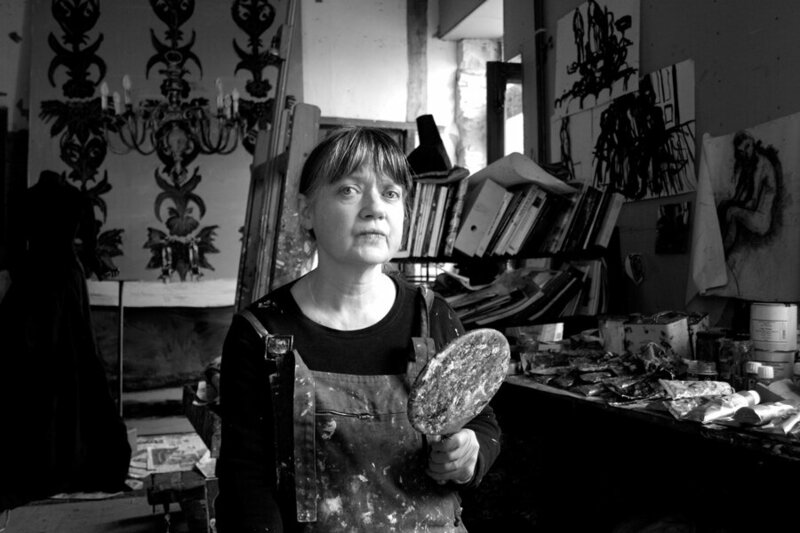 She began exhibiting in Wales and at the RA in London, winning the Aberystwyth Open in 1992, the Mostyn Open, the Gold Medal at the National Eisteddfod, the Hunting Observer Art Prize (1993) and second prize at the BP National Portrait Award. She was BBC Wales Visual Artist of the Year 1994. She exhibited in the 90s in important touring exhibitions such as Disclosure(s) from Oriel Mostyn and one-person exhibitions Blood Ties from Wrexham Arts Centre, Facing the Self from Oriel Mostyn and The Black Cot from Aberystwyth Arts Centre. She won the prestigious Jerwood Painting Prize in 2003 and was made an M.B.E. in 2006 for services to Welsh Art. A Creative Wales award from the Arts Council of Wales in 2006 enabled her to realize a long-held ambition to make sculptural automata, kinetic and sound-based versions of some of the themes and props from paintings of interiors and women. A further award in 2013 led to the creation of Florilingua, an installation of paint, sound and video collaborating with seven contemporary poets, which formed the centerpiece for her one-person touring exhibition The Rivalry of Flowers showing in Kings Place London, Northumbria University and the organising venue, Aberystwyth Arts Centre. Two monographs have been published on the artist, The Black Cot Gomer Press 2004 and Rivalry of Flowers Seren Press 2013. A major survey of 30 years work 'Distillation' opened at the National Library of Wales and Cassandra’s Rant at Ceredigion Museum, both in Aberystwyth in 2015 and in the same year Rhys James was artist-in-residence at Columbia University New York. Rhys James received an Honorary Fellowship from Wrexham Glyndŵr University in 2017. She has been represented by Martin Tinney Gallery in Cardiff since 1992 and by Connaught Brown in Albemarle Street London since 2007. Her current one-person exhibition at Connaught Brown opened in London in April 2018. Copyright © 2017 Shani Rhys James. All rights reserved.